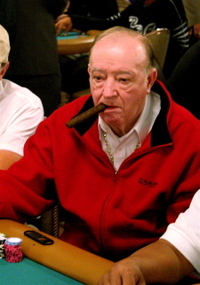 Paul “Cigar” McKinney, our favorite octogenarian poker player who famously attributed his 2005 WSOP Seniors Event win to a lifetime of “moonshine whisky, big cigars, and young women,” was 1 of 16 people nabbed during a gambling raid in Kingsport, Tennessee last Friday. According to WAVY-TV, the 82-year-old Cigar McKinney was charged with aggravated gambling promotion for allegedly organizing the game, and police also found pills identified as Schedule III narcotics in his pockets. Schedule III narcotics include everything from amphetamines to codeine to methcathinone and barbituates (yum!). In lieu of a Oops! I Crapped My Pants joke, we’ll honor Cigar and his penchant for young women with photos below and after the jump (NSFW) of our favorite Aussie top-dropper Emily Scott. For more on the story, including how one man was charged with moonshine possession, go here.